We had quite a day on Saturday, with snow, 50 mph plus winds, a tree down in front of the house, and a live wire crackling in the road. After that, the power was off until late that night. Thanks to all good sports who came anyway; it was fun looking at paintings with cell phone flashlights. We got hot coffee from Ed's house in another part of town and carried on. Sunday was beautiful, and we had both lights and heat! 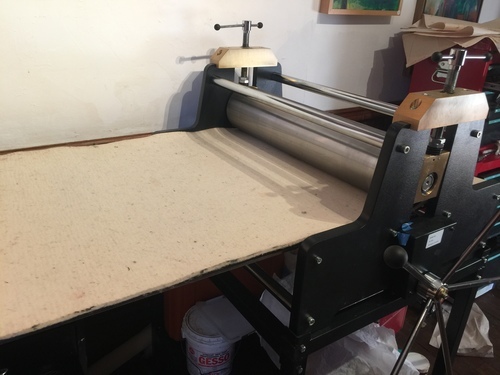 and my new etching press! 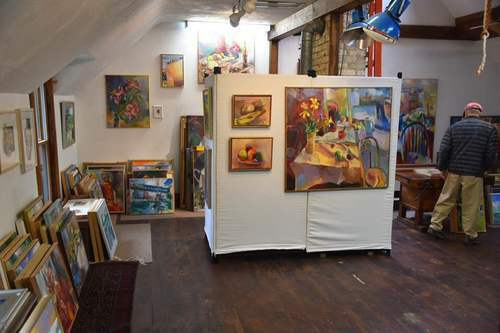 Painter Martha Hayden will open her home and studio in Sharon, Wisconsin, for her annual studio exhibition, Saturday and Sunday, October 20 and 21, from 12 to 5 p.m. 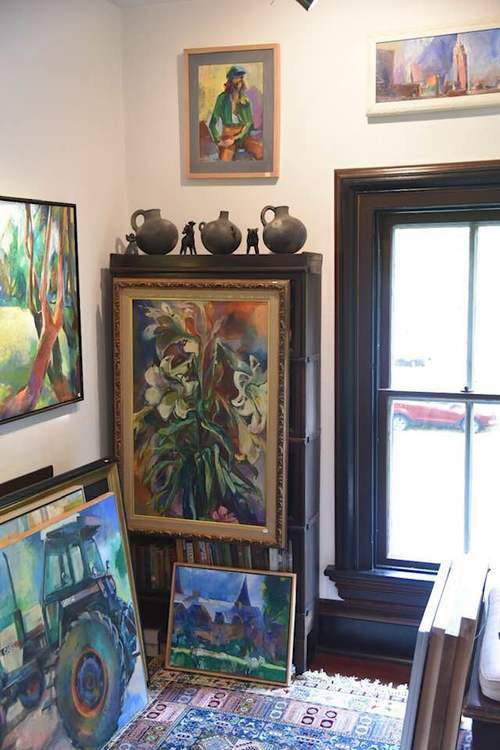 Located at 143 Prairie St., the home is a historic Victorian built in the 1870s. 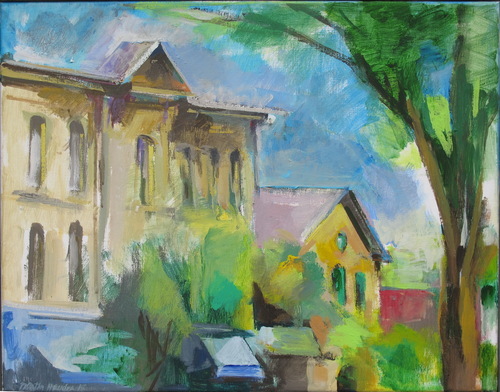 Ms. Hayden began painting in 1954 and moved to Sharon in 1962. 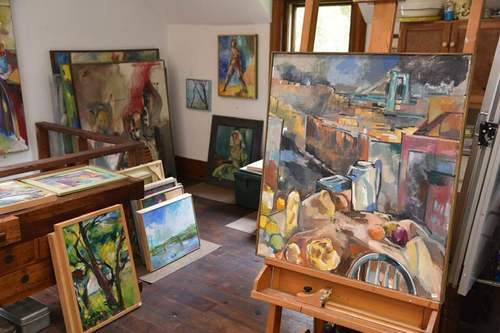 More than 50 years of work will be displayed throughout the house, including landscapes painted in Michigan, New York, Wisconsin, France, on the ring of Kerry in Ireland, and in Vilnius, Lithuania, along with still life, figure painting, etchings and woodcuts. After moving from her New York studio last year, she set up a print shop in her Sharon studio. 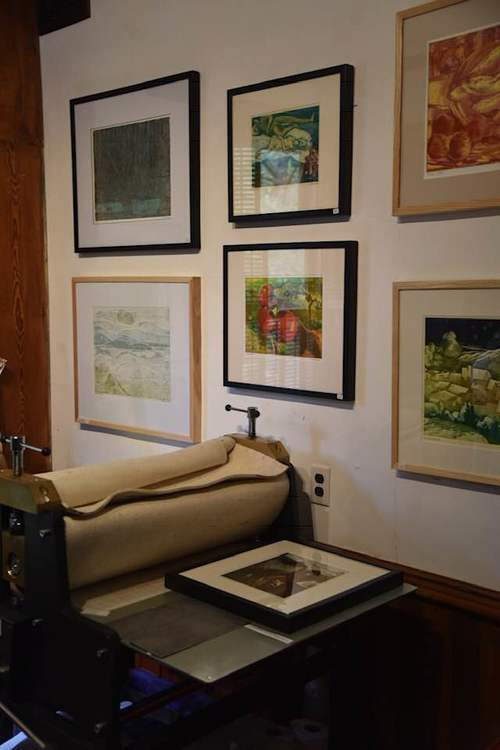 Visitors will be able to see her etching press, and there will be an exhibit explaining the etching process. The plates used to make etchings and the blocks used for woodcuts will be on display. This year Hayden's work won awards at printmaking exhibitions in Indiana, Colorado and Virginia. Her work was featured in New York City in exhibits at The National Arts Club, The Old Print Shop and Central Booking. The Wesserburg Museum in Bremen, Germany and the Harvard University Library purchased her artist books and The University of Wisconsin Library at Milwaukee and The University of Wisconsin College of Liberal Arts, Madison acquired works She had a one-person exhibition at Columbia College (MO)and is included in a new book, “Artist’s Homes and Studios” by E. Ashley Rooney. 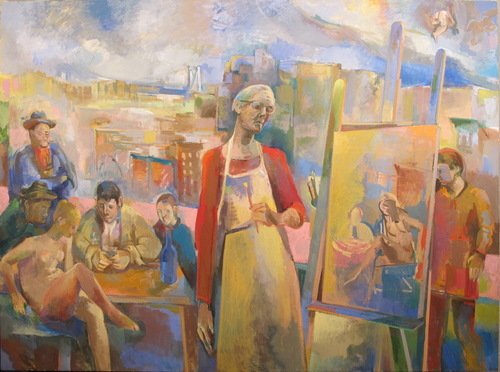 Two large allegorical paintings (70 x 54 inches) shown at ART PRIZE will be among others exhibited. They are part of a series that references the "History of Art" combined through the eyes of the artist; using self portraits, contemporary landscape and "quoted" historical images. Martha Hayden is a graduate of the school of the Art Institute of Chicago. 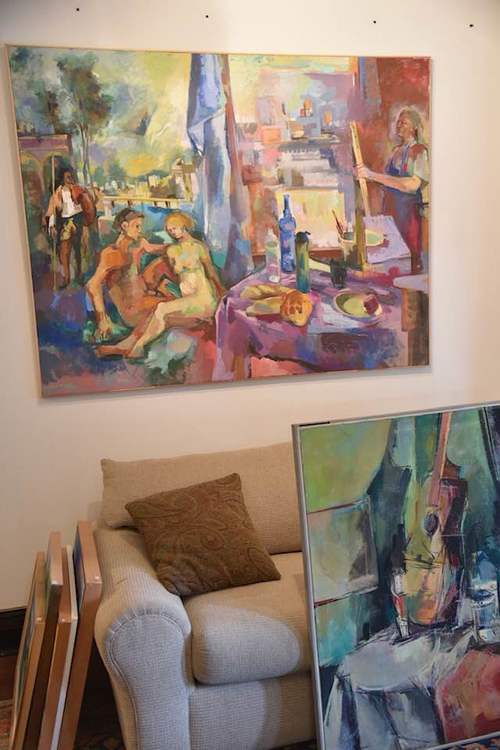 She studied with the Expressionist painter Oskar Kokoschka on a fellowship from the Art Institute of Chicago. 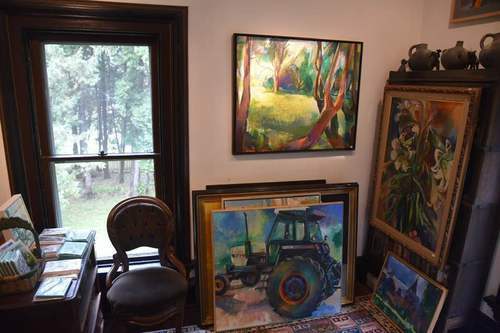 She has painted in Europe, Mexico, and Africa. Hayden’s work is in over 2500 collections worldwide, including The British Museum in London, The Museo do Arte Moderno in Sao Paulo, Brazil, the Brooklyn Museum in New York, and the Smithsonian Institution in Washington, D.C. Corporate collectors include Ameritech in Chicago, Metro-tech in Minneapolis, General Telephone in Indianapolis, Frito-Lay in Dallas, and The Hyatt Residency in Hilton Head (NC). My daughter, Mary Kathleen, and I spent 4 days or so in Cedarburg , staying at the Washington House Inn. It’s an interesting historic hotel. We had a room on the 2nd floor with a lot of windows looking over the main street. In the mornings they had lovely breakfasts with home made coffee cake and other goodies. There is a lot of subject matter within walking distance; a dam, a 5 story mill, and a main street full of stone building,. 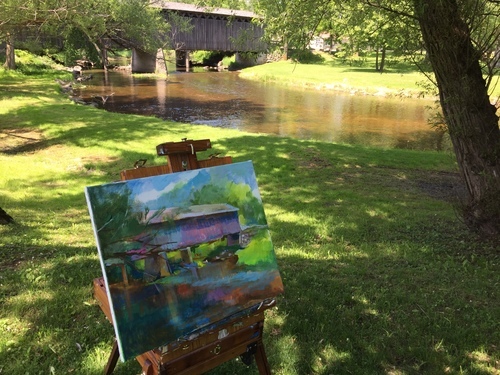 Mary Kathleen was pleased to sell her painting of the mill; her second sale on our summer trips. This was our third trip to Cedarburg together. 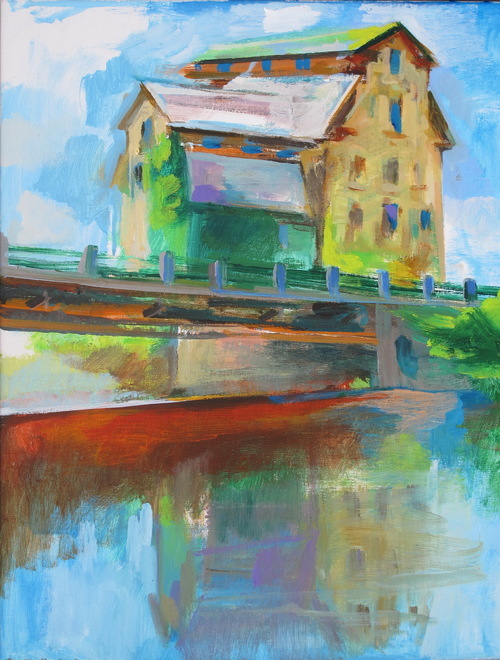 This is my painting of the Cedar Creek Mill, photograph above. The water simply dissappears, although you can hear it fall. This massive mill, built in 1855, dominates the landscape. It is limestone, some of it quarried on site. The monitor roof is divided with clerestory windows. Most of the original 12 over 12 light sashes remain. The lower walls are 32 inches thick. Here is the falls from the other side. Cedarburg was founded in the 1840’s and many of its limestone and cream brick buildings are relatively unchanged. Washington Street is listed in the National Register of Historic Places, with over 100 building considered significant. Mostly they house coffee shops and botiques, so if you need to buy any ordinary thing you have to drive out a bit. The first day, a Sunday, they had everyone painting on the main street. This is the Lehmann Hardware Store, 1874, and the Louis Hoehn Residence, built 1870. 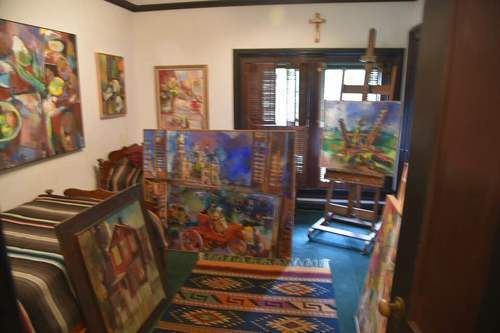 The third floor of the hardware store was a Lodge Hall. 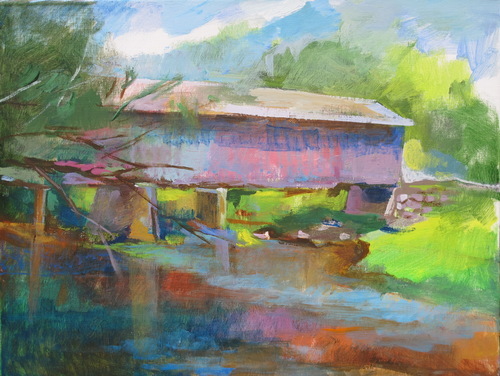 One of my favorite motifs is the Last Covered Bridge; I keep returning to it. 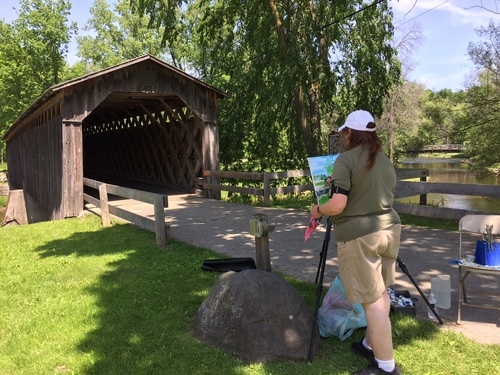 Here is Mary working on her painting. I thought it might rain, so I set up inside. This bridge was built by the Town of Cedarburg, Wisconsin in 1876 and was known as the "Red Bridge." The original span measured 120 feet long and 12 feet wide. Building materials were pine logs, cut and milled near Baraboo. Squared timber and planks were hauled to the proposed site on Cedar Creek where the pieces were fitted and set in place. The lattice truss construction consisted of 3-inch-by-10-inch planks secured by 2-inch hardwood pins, eliminating the use of nails or bolts, and floored by 3-inch planking. It is now very rare. In 1927, a center abutment was placed to carry the heavier traffic of automobiles and trucks. 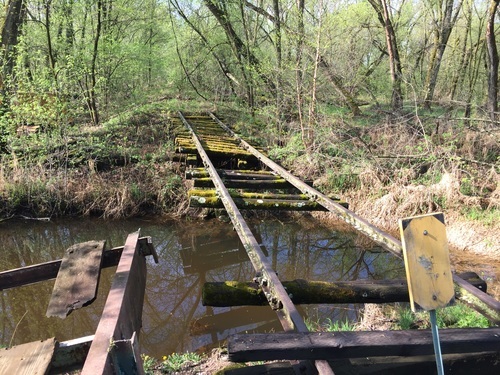 The bridge was used until 1962. It is the last surviving covered bridge in Wisconsin. It is always hard to find a place to set up, and there is a lot of equipment to schlep. Here I was fortunate to find a bench, in the shade, and just at the right angle. . 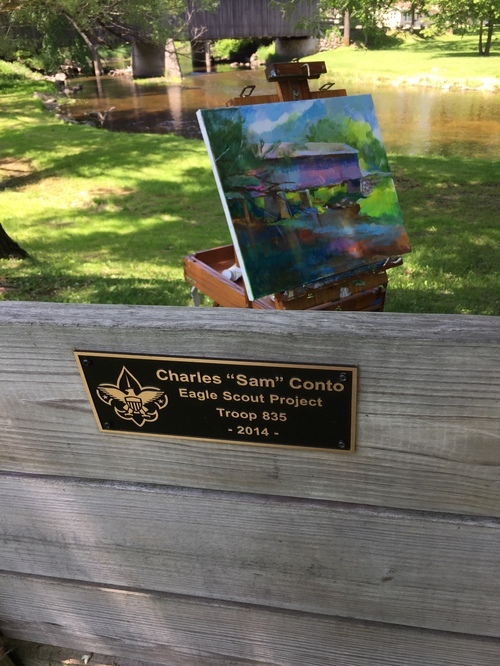 Thank you Charles Conto, the eagle scout who put it there. 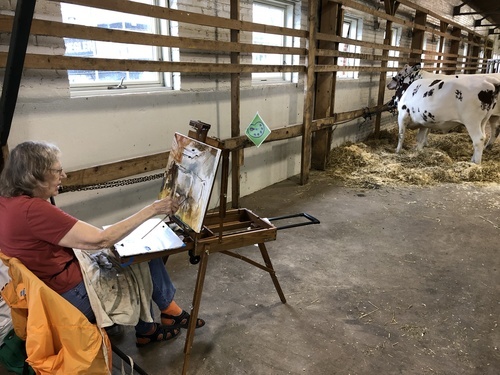 There was Plein Air painting at the Wisconsin State Fair on Monday and Tuesday. 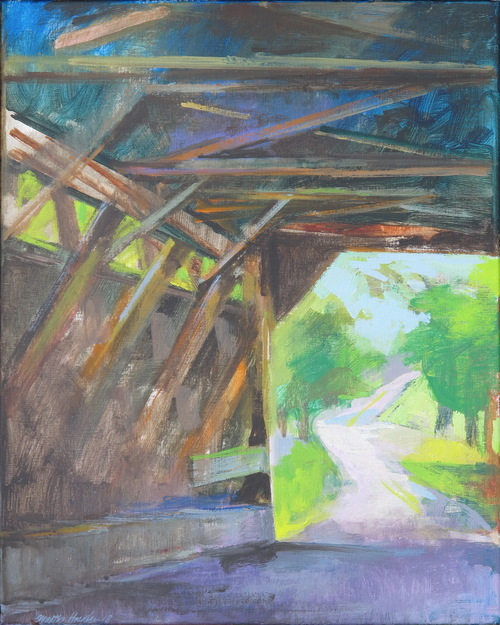 Monday, it was raining hard, and I wandered around the barns looking for a spot to paint inside. I settled on these two steers. 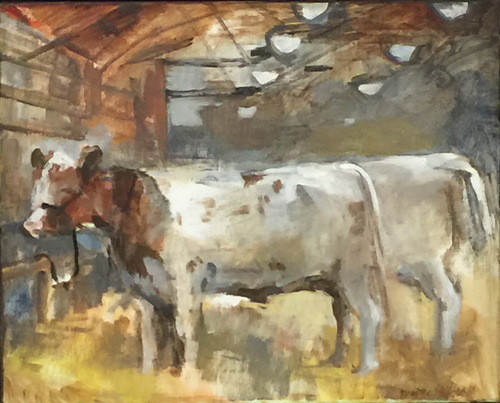 Later, I was very surprised to be awarded "Best Dairy Animal" for this painting titled "Meat Barn." I really enjoyed the Steam Power Show in Sussex, Wisconsin. I had no idea there were steam powered lawn movers, separators, and washing machines. There was a steam powered sawmill, sawing logs. There were several working thrashing machines, and I found out why the belts are so long. It is to keep the steam engine away from the grain and chaff. 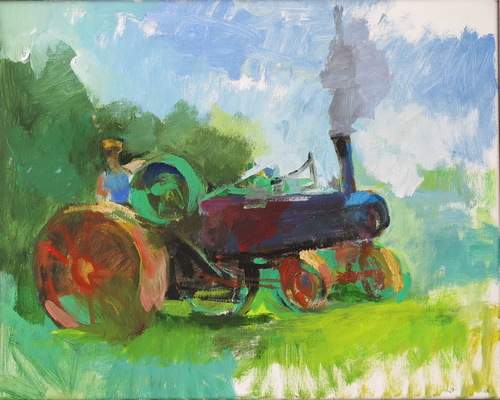 Here is a steam powered Case tractor. This spring, I visited my daughter Bridget Hayden, a professor of anthropology at USM in Hattiesburg. We went to nearby Laurel, Mississippi. Laurel is the capitol of Jones County, which once tried to secede from the Confederacy. 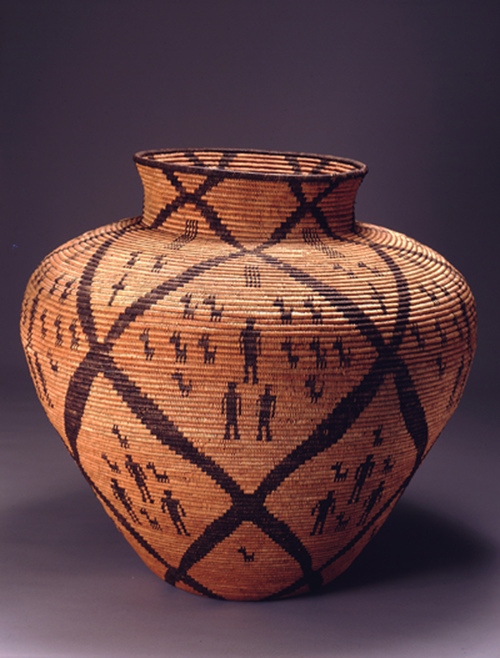 The most impressive exhibits are the Native American baskets representing 81 North American tribes, collected by Lauren Rogers’s great aunt, Catherine Gardiner and donated to the museum in 1923. Very interesting are Japanese wood block prints and a set of blocks that illustrate the printing process. 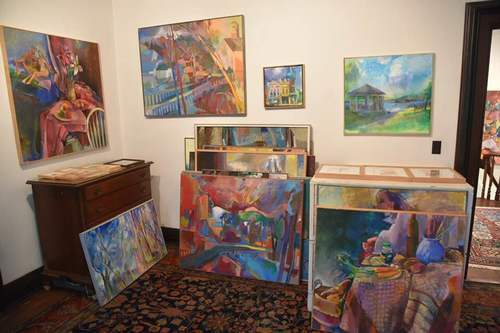 A collection of paintings by Mississippi artists was also on display. 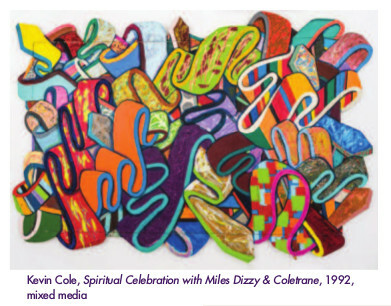 Kevin Cole of Atlanta, GA uses twisting and curling canvas, influenced by Frank Stella, which reference jazz and deal with traumatic events, both present and historical. Sisavanh Phouthavong-Houghton emigrated from Laos at the age of four. 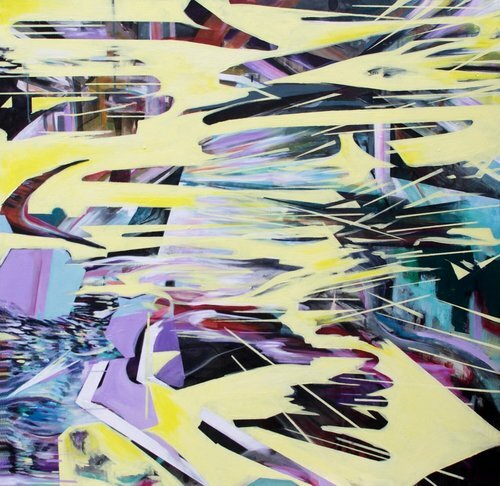 Through hard edges and strong contrasts of shapes and colors, she explores violent memories of her homeland. She lives, works and teaches in Kansas. I liked best the work of Carl Joe Williams who uses materials found on the streets of New Orleans to create innovative mixed media works incorporating music and television to address social justice issues. His four paintings on doors are an impressive combination of painterliness with a sophisticated recall of 1930’s realism that works well with his social messages. 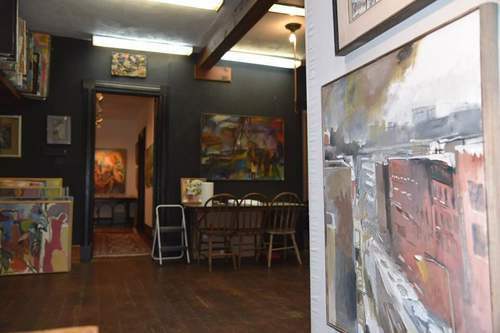 The exhibition was beautifully displayed and was an exciting and unexpected addition to a nice afternoon spent in Laurel. I like to paint outside. 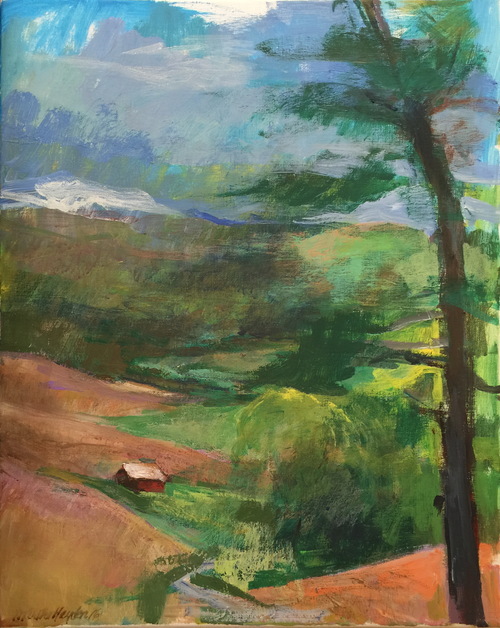 I dislike the term ‘Plein Air’ because it has come to signify a quasi impressionist style, but I do like to be outside and in the landscape. It can be demanding. It can be too hot, too cold, too much in the sun, people want to talk, someone parks a car in front of you, bugs bite, etc. etc. There is always a time limit because the light will change. 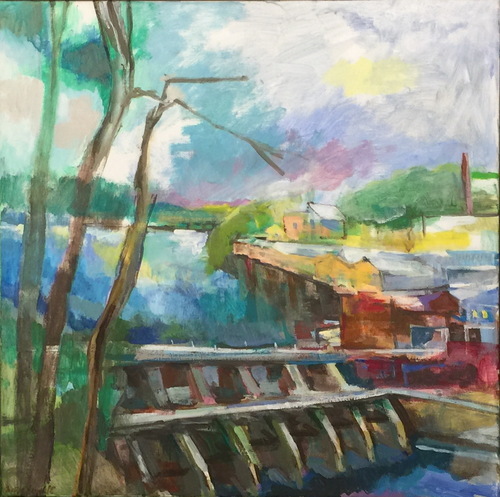 All of these situations add an urgency that can be absent in the studio, and which lends excitement and spontaneity to outdoor painting. 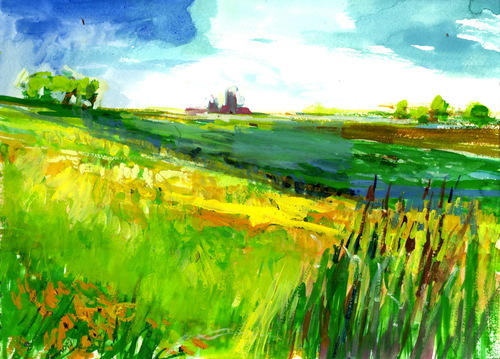 Landscape requires great simplification. Order must be made out of chaos. There is no way to “get” all of it, and really seeing it is about making choices. It is the space, the movement and the light that I am after, not verisimilitude. 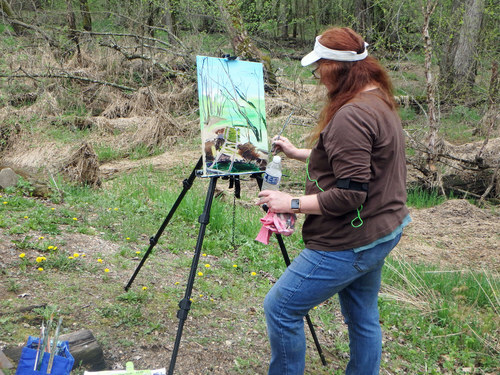 This year, I am pleased to be doing two ‘Plein Air’ events with my daughter, Mary Kathleen Lynch. 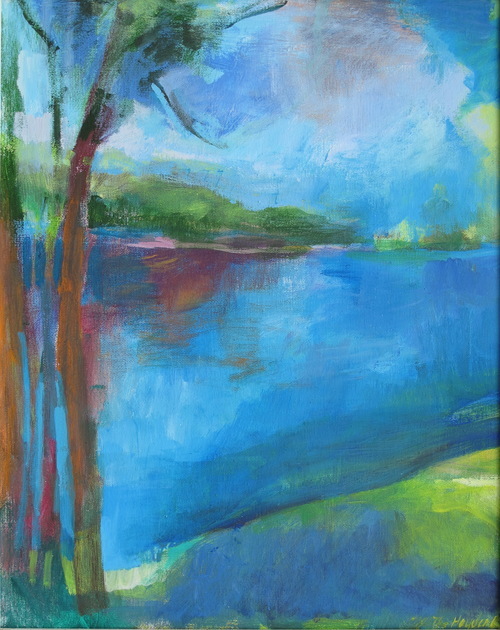 Mary Kathleen started to paint when she was in high school, and has been working hard at it the last few years. She has a different aesthetic and is developing an attention to detail approach. 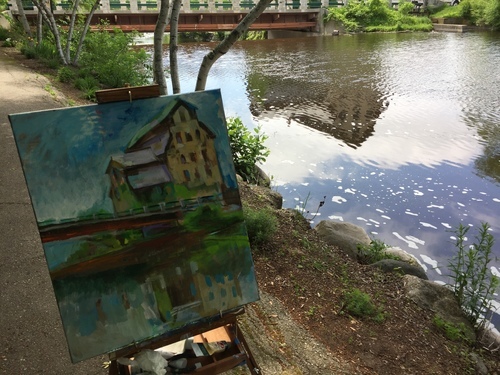 There are lots of Plein Air events in Wisconsin, and although I really don’t approve of ‘competitive’ painting, they can be fun to do. It’s nice to be with interested people, and it is easier to set up with a group; one is less exposed to unwanted attention. Usually the organizers stamp the backs of blank canvases to insure they are actually painted from nature and on site, and there are time limits and designated days to paint. 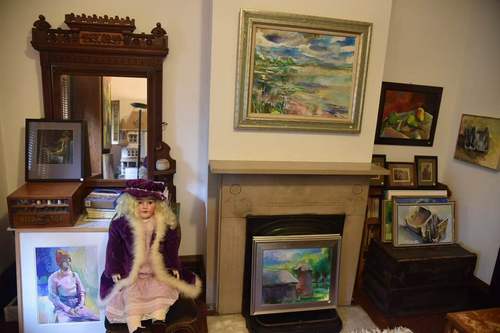 At the end, the works are displayed locally and people are encouraged to come and look and buy. 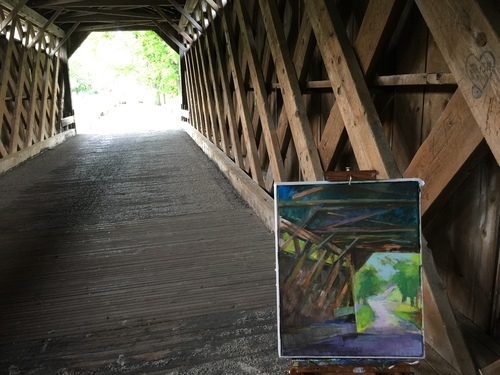 It can be pleasant for the painters, fun for the spectators, and helps to make people more aware of painting and what is involved in producing it. It is a birders and painters wonderland. 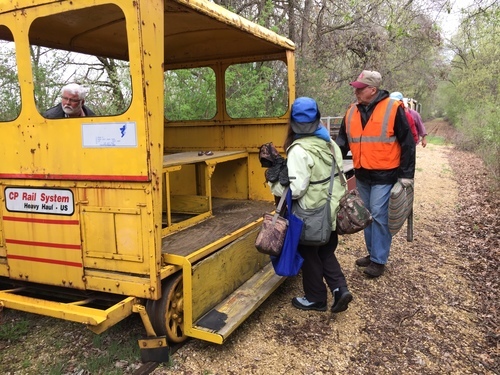 https://midwestweekends.com/plan_a_trip/nature/birds_wildlife/birding_tiffany_wildlife_area.html We were dropped off at the end of the line, and picked up again 3 hours later. I am proud that my daughter made a painting there that won an award in the concluding exhibition. 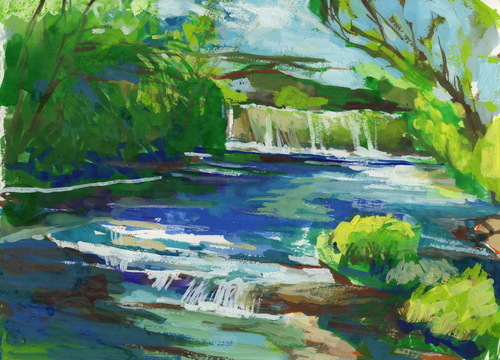 The works are being shown at the Eau Claire regional Art Center’s Janet Carson Gallery, at the State Theatre in downtown Eau Claire. Until August 17.